The Brook Street site, a 2.7-acre former brownfield, is located in a densely settled residential neighborhood on the banks of the Spicket River. This former mill building and commercial laundry site had been abandoned for nearly 20 years, when a neighborhood planning process identified the site as key to local revitalization efforts. The redevelopment project was led by Groundwork Lawrence and Lawrence CommunityWorks. Lawrence CommunityWorks began the Brook Street project's community outreach process in 2002 through an event called the North Common Neighborhood Summit, at which the Brook Street site was identified as an obvious property for park redevelopment. Residents recognized it as a substantial piece of vacant land in the middle of a large, dense neighborhood, and given the lack of recreational green space in the area, they greatly supported the idea of creating a park. That same year, GWL and LCW led a series of community design charrettes and meetings to create a conceptual proposal for a park on the Brook Street site. Then, based on the community-preferred park concepts, Groundwork commissioned a detailed park design and got cost estimates from a landscape architecture firm.The final phase of the project, the construction of the park, took place in the spring and summer of 2006. Later that year, the park was dedicated to Dr. Nina Scarito, an accomplished Lawrence obstetrician who is said to have delivered 20,000 babies in the City during her career. The park was made possible through a combination of federal, state, city, and private funds, including an Urban Self-Help grant. Dr. Nina Scarito Park now provides safe recreational opportunities for hundreds of children and families, contributes to improved air and water quality, and helps to grow the City's tax base by adding value to the surrounding neighborhood.The park is also the first jewel in the Spicket River Greenway, a project that GWL continues to work on. This former industrial boiler site sat idle and vacant for decades until the developer, Riverwalk Properties, saw the potential of the property and wanted to turn it into a desirable commercial real estate location. Mr. Salvatore Lupoli, owner of Riverwalk Properties, wanted to give back to the community and realized that creating a safe campus setting along the riverfront would entice new businesses and residents to the area. Therefore, he and his company developed the property as greenspace and a community center. The project is a story of how minimal federal funding catalyzed large private investment, as the private developer funded the cleanup. The cleanup included removal of asbestos, fuel tanks, lead and PAH-contaminated soil. 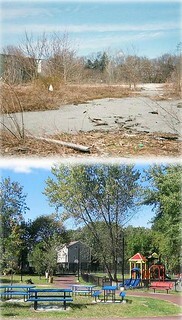 After completion of the cleanup and removal process in the summer of 2009, demolition and construction began on the parcel with the building of a community center and the preservation of green space as a river park. The 290 Merrimack Street site is an integral part of a much larger redevelopment of Merrimack Street that has created 1.2 million square feet of retail space and leveraged 2,000 jobs for the city from the 200 companies now located there. The park and community center are donations to the neighborhood that will enhance the state-funded riverwalk through the area. This former foundry and cotton mill was found to be contaminated with asbestos, lead, and arsenic when investigated during EPA investigation. Lawrence Community Works completed both Phase 1 and Phase 2 of brownfield contamination investigation work on the site, and the findings were that groundwater had been impacted by residual heating oil, and the soil contained PAHs and metals. LCW, the lead developer for the project, then constructed high quality rental units, commercial and retail space, and community facilities on the site. The housing units are designed to be energy-efficient and affordable with a variety of on-site amenities, including a child care center with a riverfront playground, and green space allowing for public access to the Merrimack River. For almost 100 years, the former Covanta property served as a supplemental electrical power plant for the industrial mills in Lawrence. Resting on the banks of Stevens Pond, the property produced electricity for the City of Lawrence. In 1998, the plant closed, and the incinerator was demolished and limited cleanup activities were performed. Rather than selling it for commercial or industrial reuse, Covanta desired it be made available for public space. In 2008, the city purchased the facility for $1.00 and began the process of revitalizing the property with the recommendations from the design charrettes. The city used its EPA Brownfields Cleanup grant awarded in 2008 to clean up soils contaminated with arsenic, dioxin, and benzo(a)pyrene. A portion of the property was capped and covered with clean soil to prevent further contamination. 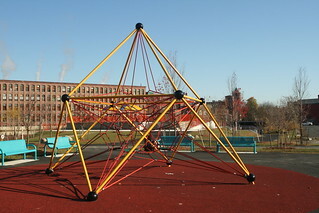 The city, along with Groundwork, redeveloped the property as the Manchester Street Park, making use of a variety of green building and landscaping techniques including permeable pavement, playground equipment, a community garden, bioswales and greenspace. A gazebo was constructed on the property using a previously existing building foundation. Manchester Street Park has now become an endpoint to the Spicket River Greenway. Development of the park and greenway is a great improvement for the densely populated Arlington neighborhood, providing local residents with more than five acres of open space and access to Stevens Pond.The park is a great success story of brownfield renovation, and a terrific addition to the Lawrence landscape. For more information and news about the park, click here!